North American ski areas are known for their highly efficient, fast ski lift systems and this means you will rarely come across few queues and you will enjoy seemingly deserted ski slopes. As with most things in the US, all ski lift and ski run grooming equipment is modern and high tech. In North American ski resorts, you are guaranteed excellent skiing on slopes that are immaculately groomed even after the heaviest snowfalls! 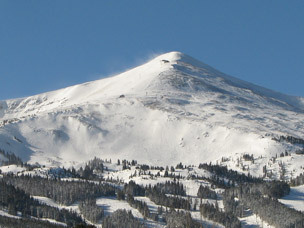 For powder hounds, North American ski resorts, such as Aspen and Breckenridge are simply heaven on earth! Thigh-deep powder is a regular phenomenon in North American ski resorts and snowfalls in the US are often measured in meters after one dump! The climate is very dry and the ski resorts are usually further away from the sea making for perfect off-piste conditions. You will not find the same super-ski areas as you find in Europe, but North American ski areas are a lot more versatile – you can ski almost anywhere! The ski area boundary is clearly marked and patrolled - including off-piste areas which is reassuring for those venturing off-piste for the first time. The ski run grading system is not the same as in European ski resorts – colours are replaced by diamonds! A red run is a “single diamond” run, and a black run is a “double diamond” run!